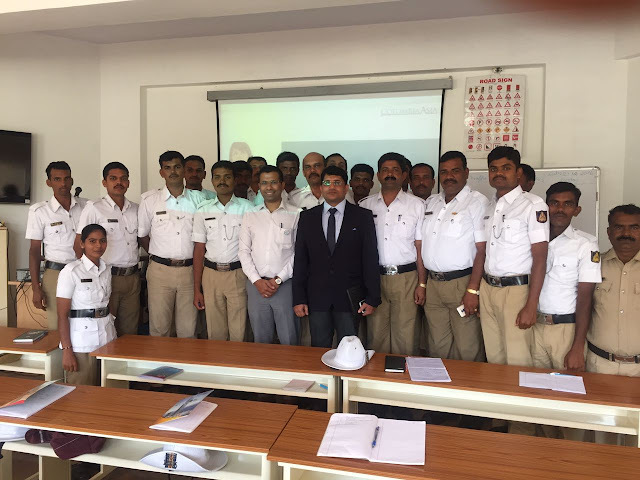 Photo caption: Dr. Firozahmad H. Torgal, Consultant Emergency Medicine, Columbia Asia Referral Hospital, Yeshwanthpur, with the new traffic police recruits at Traffic Training Institute. Bangalore: You too can save a life. And for this you don’t need a medical degree. Simple knowledge about ‘Basic Life Support’ (BLS) techniques can go a long way in saving lives in emergency situations. Columbia Asia Referral Hospital, Yeswanthpur conducted a session of BLS Training programme for new police recruits at the Traffic Training Institue of Police today at 11:30 am. Around 30 police personnel from the city took the first step in being Good Samaritans by learning the much needed basic life-saving steps in case of any road traffic accident or other emergencies. “Traffic policemen are usually the first to reach an accident spot. Providing basic life support during the golden hour can help in preventing pre-hospital deaths from injuries if there is a delay in receiving hospital treatment or medical care. Hence, it is extremely crucial that traffic policemen are well aware of basic life support techniques and can handle an emergency before the ambulance reaches the spot,” said Ms. Kanchan Sanyal, Chief of Medical Services, Columbia Asia Referral Hospital, Yeshwanthpur. This training will help them to learn special skills required to deal with emergencies faced by accident victims. Skills to perform Cardio pulmonary resuscitation (CPR) through chest compressions, maintaining accident victims breathing by providing appropriate rescue breaths, relieving choking, etc can help increase chances of survival and hence save many lives. Trained doctors from the hospital will use videos, practice demos, presentations; etc. to impart these skills and the participants can get hands on experience as well. With this Columbia Asia Hospitals has trained around 10000 people in BLS Training.